Swim for Home-Start Ashford & District!! On 24th May one of the families formerly supported by Home-Start Ashford took part in a sponsored swim at Tenterden Leisure Centre. 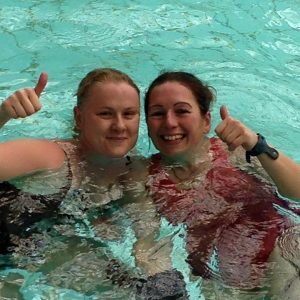 Amanda, along with her friend Emma, not only swam 3 Kilometres in exactly one hour, but also raised an amazing £723 in the process from donations online and a raffle drawn on the day of the event!!!! They were outstanding and we would all like to say another huge thank you for their many weeks of training and organising such a feel-good event. With the money raised from this event we are able to fund our next Volunteer Preparation Course in September which will enable 8 newly trained volunteers to support more local families. Well done and thank you Amanda and Emma. At the beginning of the year Romney Marsh & Hythe Lions Club held four quiz nights to raise money for Home-Start Ashford & District. We entered a number of teams that included volunteers, trustees, staff and members of Chill with Dad. We would love to be able to report that we came away winners however the only prizes we got were wooden spoons! Thank you to the Lions Club for raising £616 over these events.